[/media-credit] The Fab Five helped the University of Michigan win NCAA championships in 1992 and 1993. 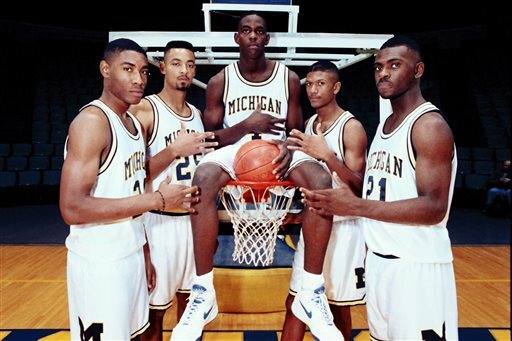 From left in 1991, Jimmy King, Juwan Howard, Chris Webber, Jalen Rose and Ray Jackson. Was this year’s national championship game really a Fab Five reunion? Few understand the magnitude of exactly what happened in the Georgia Dome that night. Although the Louisville Cardinals pulled out the win against the Wolverines, they shared the spotlight with five Michigan athletes who weren’t even on the court. 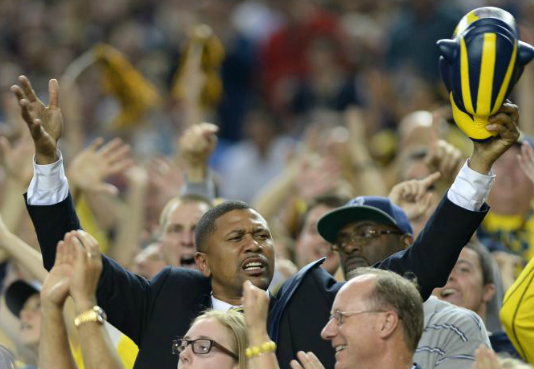 These five men brought notoriety to Michigan’s basketball program: Jalen Rose, Juwan Howard, Ray Jackson, Jimmy King and Chris Webber. Many basketball fans know them simply as the Fab Five. Depending on whom you ask, the answer may differ. But basically it is the name given to five black basketball players who were considered part of the greatest class ever recruited by a college team when they joined the University of Michigan in 1991. Look them up; you’ll be surprised how intriguing these young men have been. In 2011, ESPN Films released a documentary on the Fab Five. To make a long story short, Chris Webber, one of the members of the Fab Five, has been estranged from the university for a long time. But for this year’s championship game, Webber joined the rest of the Fab Five at the Georgia Dome to cheer on the Wolverines. Well, not exactly. While four of the Fab Five sat together , Webber was elsewhere. He tweeted pictures of himself at the dome, but he appeared to be sitting in box seats. [/media-credit] Two of the Fab Five, Jalen Rose and Ray Jackson, supporting their alma mater. Maybe his absence had to do with former teammate Jalen Rose’s recent comments about whether Webber would show during an interview with Bill Simmons on “The Best BS” for the Grantland Channel. Rose references a major occurrence during the 1993 NCAA Championship game between the Wolverines and the University of North Carolina Tar Heels. In this game, Webber lost the game for Michigan by calling a timeout, when the team didn’t have any left. This mistake was the end to Webber’s college basketball career and the Fab Five. “The elephant in the room has been Chris Webber,” Rose said. “While he loves us like brothers and vice versa, there has been a communication separation that has basically taken place since we all were teammates. Maybe Rose’s bold statements provoked Webber’s presence at the game but his absence with his former teammates. I’m sure everyone is just happy no random timeouts were called during this game. Regardless, Michigan has yet to win a NCAA championship, and Webber might want to get in touch with Ron Artest about his psychologist because clearly he still has some issues that need to be faced. This has been Moments With Maxine Dior. Maxine Dior Chapman covers sports for 101 Magazine.